Sheet metal fabrication and forming involves more than just cutting, pressing and bending. The work often extends as far as the assembly and installation of the finished product. Sheet metal processing requires great precision, special tools and specific technical skills, and the operations involved generally have to be performed on dedicated machines in specialist workshops and factories. These machines not only have to be installed in the users’ premises but also require regular preventive maintenance to say nothing of the occasional repair job. The companies that supply them obviously need a fairly large van to carry around all their material and equipment. 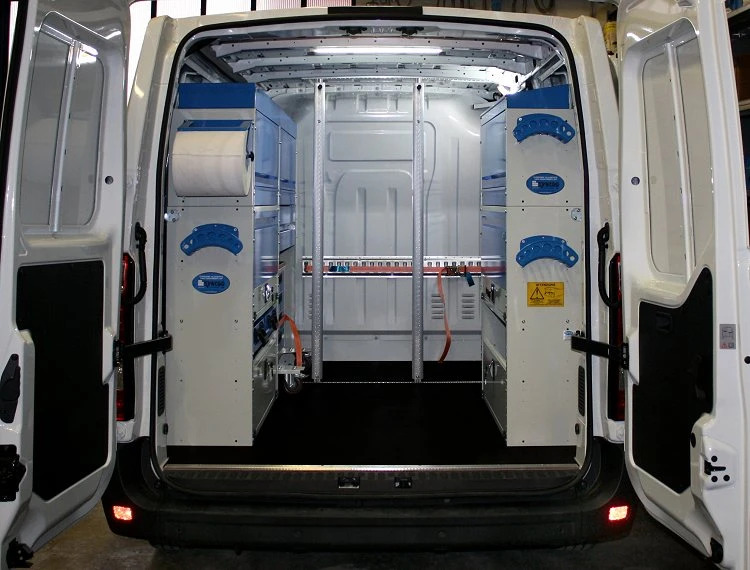 On top of this, any racking system has to be designed and installed in a way that allows operators to move around the van safely and easily, just as they can back in the factory or workshop. This is exactly where the long experience, vast know-how and acclaimed reliability of Syncro System comes into play. 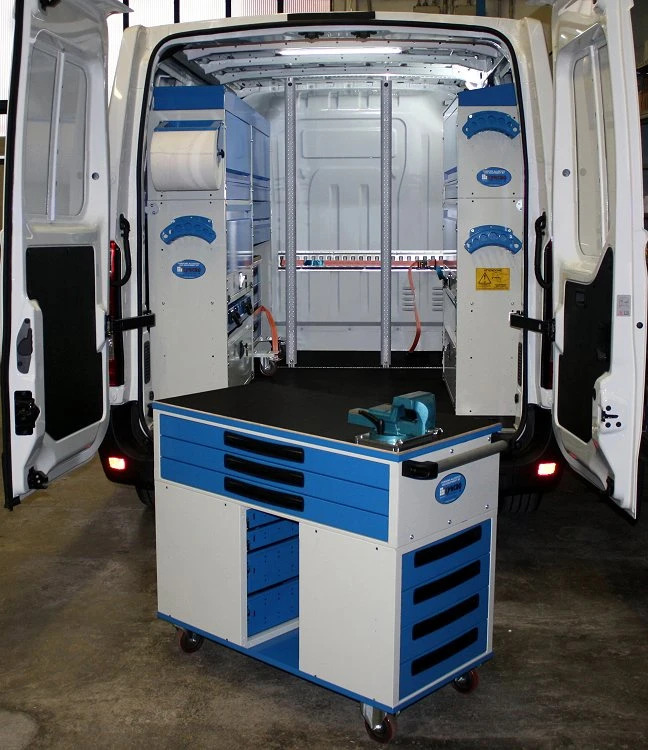 Syncro has twenty years of experience in converting van interiors into efficient mobile workshops. 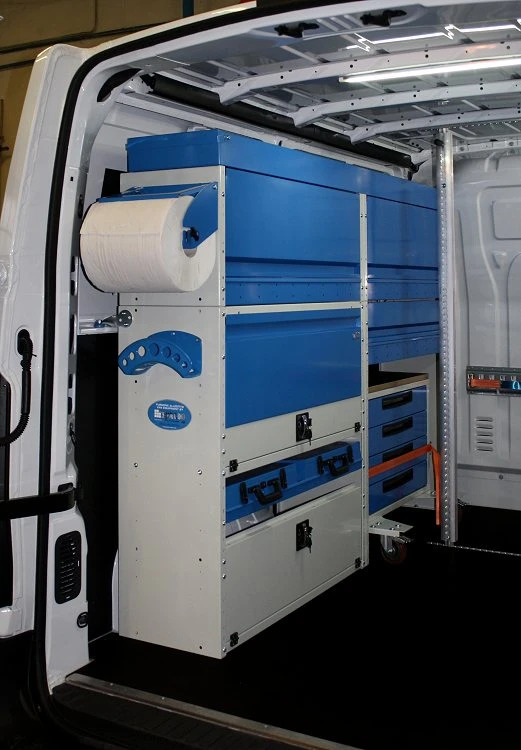 Syncro’s workshops on wheels are intelligently laid out, easy to keep tidy and can be equipped with all the accessories needed by plumbers, mechanics, engineers, cabinet makers, door and window installers, carpenters, travelling salesmen, call-out mechanics and, of course, service technicians for sheet metal processing machines. In two decades of producing and installing storage and accessories for mobile workshops, Syncro has developed the ultimate modular racking system. Syncro elements can be combined in an almost infinite number of ways to create the perfect solution for the needs of all users. Thanks to Syncro’s modular racking system, virtually every upfit is unique, specially designed for the job and tailored to fit like a bespoke suit! It comes as no surprise, therefore, to learn that Syncro System had absolutely no trouble fitting out this van for sheet metal machine maintenance technicians. 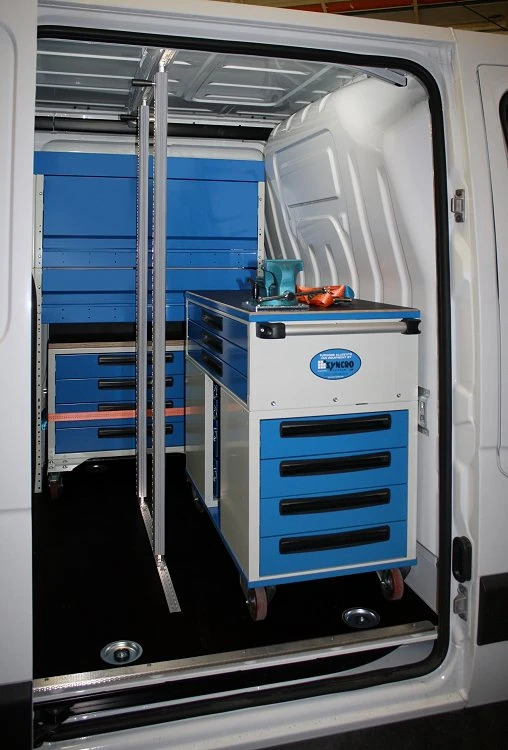 As soon as the customer’s requirements and the model of van were known, Syncro’s racking specialists were able to come up with a highly practical and functional configuration, and then fit out the load compartment with a series of easily interchangeable and re-combinable modules to create a practical and safe storage system. 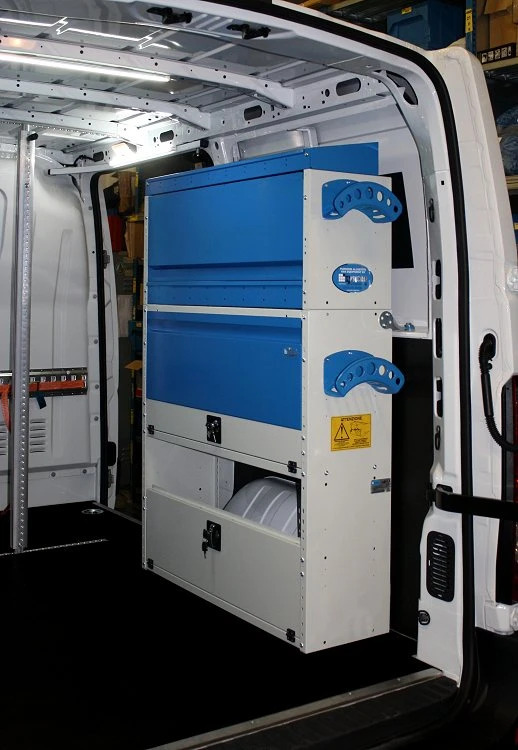 The following images illustrate the van equipped by Syncro System for a company that deals in sheet metal processing machines. As always, this conversion began with the installation of robust protective linings to reinforce the load compartment and rear doors. The floor is covered by a resistant panel of marine grade plywood to provide a perfectly flat surface for the storage units installed along the left and right side walls. Along the left side wall we can see a number of metal shelving units with doors, a cabinet for component cases, a top tray with opening ends and a compartment for stowing a practical wheeled trolley with drawers, a work top and a vice. The storage on the right side wall consists of a lockable wheel arch cabinet and various levels of shelving with metal doors. The rear walls of the storage cabinets are fitted with a paper roll holder and practical cable holders. The bulkhead is fitted with a lashing strap anchoring rail for securing machines and equipment during transit. The two vertical cargo bars installed in this travelling workshop deserve a special mention. They form part of a new system designed and made by Syncro System for securing even heavy and bulky materials and equipment rapidly and safely. The two aluminium bars engage with rails that run across the floor and roof of the load compartment. Slots in the sides of the bars can be used either to attach lashing rings and hooks or to fit other bars. 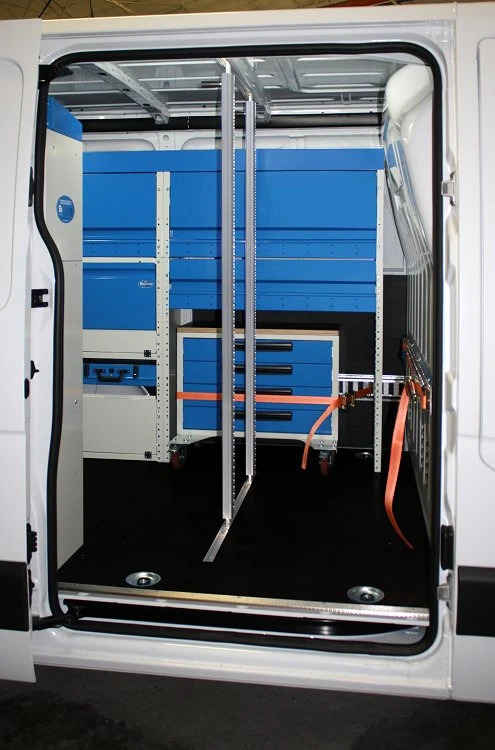 This innovative system makes it extremely easy to secure cargo during transport and even allows temporary partitions to be configured inside the van. The narrow sides of the cargo bars are covered with rubber profiles to avoid scratching and damaging cargo. To find out more about Syncro System van racking and to design your own mobile workshop for installing and servicing sheet metal machines, simply call your nearest Syncro installation centre. Our technical staff will be delighted to let you have a no-obligation quote.